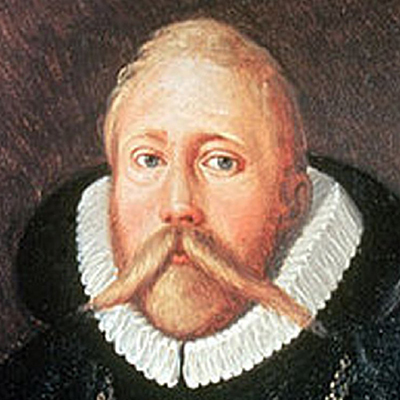 Tycho Brahe was a nobleman from an important Danish family. During his university years, he was studying law. But his real passion was mathematics and astronomy. Then, one astronomical event thrust him into astronomy. On August 24 of 1563, Jupiter and Saturn passed very near each other, nearly merging into a single point on the night sky. Tycho compared the event with the tables of motions of planets. He discovered that the Alfonsine Tables of the motion of heavenly bodies were a full month off. Prutenic Tables were in error by a number of days. So began his study of the motion of objects in the heavens. In 1572, a "new star" appeared in the sky, shining more brightly than Venus. According to classic astronomy, the new star represented a change in the heavens and had to lie below the sphere of the moon. As a note, classic astronomy held to Aristotle's belief that heavenly objects were positioned in perfect circular spheres around the Earth. According to Aristotelian model, the new star would have to appear slightly too far east as it rose and slightly too far west as it set. That did not happen, however. So Brahe concluded that it must lie above the sphere of the moon and was probably on the starry sphere itself. This contradicted Aristotle's belief that the starry sphere was perfect and unchanging. He published a book, "De Stella Nova", on this discovery. This book caught the attention of astronomers throughout Europe. Soon Tycho was patronized by Danish King Fredrick II. With the king's funds, Tycho built a luxurious home equiped for astronomical studies, on the island of Hveen. Soon Hveen became an international center of astronomical study. From his observations, Tycho concluded that the Earth had to be stationary, thus rejecting the Copernican hypothesis of helio-centrism. He also rejected the previous model of Ptolomey, because it could not predict the positions of heavenly bodies accurately. Instead, he devised a complex model of motion of heavenly objects. In this model, the Earth was the immobile center of the universe around which the Sun and the Moon moved. The other planets circled the Sun. This model incorporated part of the Copernican model, but made the Earth, rather than the Sun, stationary. In 1588, unfortunately for Tycho, King Frederik II died. Frederik's son took the throne. He did not like Tycho for his temper. In 1596, Tycho took his instruments and books of obsevations and moved to Prague, to become imperial mathematician to the Holy Roman Emperor Rudolph II. His goal was to revise the Alfonsine Tables (King Alfonso X of Castile, 13th century). He was going to base the new tables on his own system. To assist him, he hired a few mathematicians and astronomers, including one Johannes Kepler. He did not get a chance to finish his work. In November 1601, he collapsed at nobleman's home, and several days later, died. He asked Rudolph II, to make Johannes Kepler, the imperial mathematician. Johannes Kepler liked the Copernican helio-centric model, and not Tycho's model. Tycho's family fought legal battles with Kepler for years. They were able to win the possession of Tycho's instruments, but Kepler kept Tycho's books.